Vibration measurements provide information about the condition of new, existing or overhauled machinery and rotating constructions. 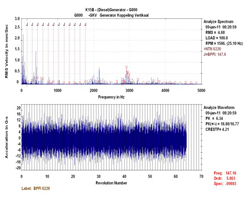 Problems are detected with properly executed vibration measurements. 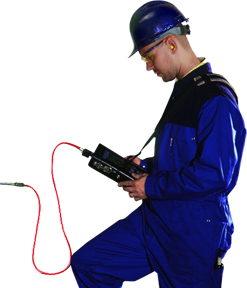 Vibration analysis is the assessment of various graphical displays of vibration data with the aim to identify the cause of the vibration. This analysis is generally seen as one of the most effective ways to detect malfunctions in rotating equipment. During a typical vibration survey, an accelerometer or other vibration transducer is manually placed on several locations on the machine, usually directly on or in the near vicinity of the bearings. Using a portable datacollector, various dynamic and static parameters as vibration and rotational speed are then measured while the machine is running normally. However, after acquiring reliable vibration data the real specialism is needed: the interpretation of the measurement. There simply isn't any measurement equipment that analyses the cause of a defect. No apparatus or computer will tell you exactly which part needs replacement. 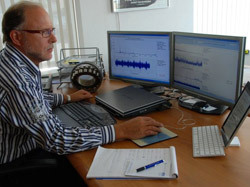 Expert analyses require much more than only the knowledge about the measurement technology or the connected computers or software. Interpretation, analysis, concluding and to recommending will always remain human work, skilled and specialized work even. That is why you will benefit from knowledge and experience that guarantee a correct analysis in all situations. With van Geffen VMS you will find this knowledge and experience with every specialist. All our engineers are well educated and have the necessary know-how. All their interpretations and analysis are based on years of experience. This will not only supply you with a quick solution, you will also be certain that it is a reliable one. Vibration measurements are an excellent tool for a single condition measurement or for Trouble Shooting a sudden problem, but is also perfectly suitable for periodic Condition Monitoring of your machinery assets. The large variety of different machinery malfunctions that can be detected on virtually every type of rotating equipment, makes vibration analysis the most effective kind of predictive maintenance.